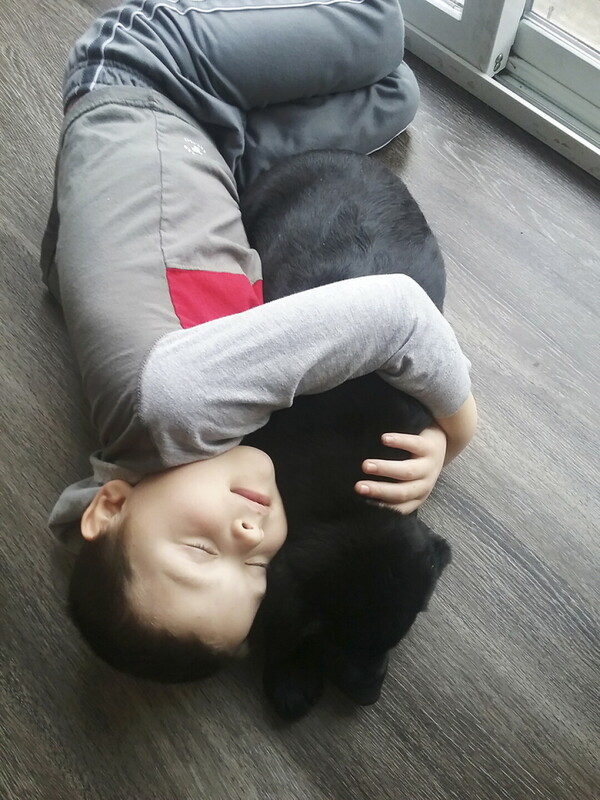 Caleb bicknell, age 7, cuddles with buddy, a english labrador puppy who the family intends to have trained to be a service dog. Caleb Bicknell’s family welcomed a new member in February, an English Labrador puppy named Buddy. At just 2½ months old, Buddy is starting the long training path to be a service dog for 7-year-old Caleb, who has Type 1 diabetes. Alison Bicknell describes her son as a “fragile diabetic,” as his blood glucose levels are unstable. He is currently unable to take part in activities other children take for granted, such as walking to school. When Caleb’s blood glucose levels swing too high or too low, he’s at risk for losing consciousness. Buddy is just starting his puppy classes, and it will be another year or two until Buddy is ready for official service dog training. But once Buddy is a fully-trained service dog he will wear a service animal vest and can accompany Caleb everywhere. The two will even sleep in the same bedroom. The plan is for Buddy to also wear a special alarm button that when pushed will automatically dial 911 in case of an emergency. After Buddy is an official service dog, he will go on to specialized scent training. English Labradors are known for their keen noses, and the hope is that Buddy will be able to detect the scents that accompany changes in a person’s blood sugar. Buddy will then be able to alert Caleb, and those around him, before Caleb becomes ill. This specialized scent training will require the Bicknells to relocate to Minnesota for three to six months, costing around $5,000. The effort is certainly worth it, as helping Caleb manage his diabetes is a 24/7 job for his caregivers, including his mom and his aide at school. With a little help from Buddy and his superhero-like nose, Caleb can become more independent. To help offset the costs of Buddy’s training and the Bicknell family’s temporary move to Minnesota, a GoFundMe account has been set up: gofundme.com/service-dog-training-t1d-caleb. Additionally, donations can be made at any Wells Fargo Bank to the “Caleb Bicknell Benefit,” account #1313776575.